We’d love your help. 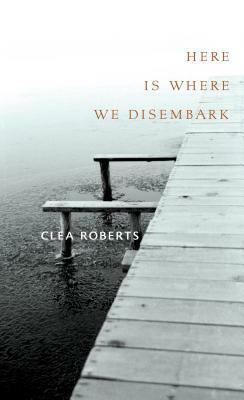 Let us know what’s wrong with this preview of Here Is Where We Disembark by Clea Roberts. With her remarkable debut collection, Yukon poet Clea Roberts proffers a perceptive and ecological reading of the Canadian North's past and present. To ask other readers questions about Here Is Where We Disembark, please sign up. This is beautiful poetry... about northerness, about history, about people. Sometimes I don't "get" poetry, but this I want to reread. This review was original published in The Navigator newspaper in February of 2014. In Here Is Where We Disembark, Clea Roberts weaves a single-breathed story of the North on each page. Whether detailing "the dusk / as it slips... / between mountains" of present day Yukon, or "the caribou... / [with their] antlers rocking / silver under the moon" of the Gold Rush, almost every poem and instant within contains a lurking warmth that seeks to expel itself from frigid surroundings. Roberts approaches This review was original published in The Navigator newspaper in February of 2014. In Here Is Where We Disembark, Clea Roberts weaves a single-breathed story of the North on each page. Whether detailing "the dusk / as it slips... / between mountains" of present day Yukon, or "the caribou... / [with their] antlers rocking / silver under the moon" of the Gold Rush, almost every poem and instant within contains a lurking warmth that seeks to expel itself from frigid surroundings. Roberts approaches every moment with a naturalistic flourish, painting words like a fire-warmed tapestry; simple, textural diction, but layered around the thrum of human heart-beat to give her work the gravity of nature and humanity combined. Roberts is an exemplary execution of the rich tradition of Canadian poetry, interpreting ourselves through the lens of the world around us. Her collection, split into two parts, reminds of her contemporary Michael Crummey. His recent collection, Under the Keel, achieves the same feeling of a satisfying, nourishing mouthful in each collection of words. Where Crummey's poems tend towards the light-hearted and individual, however, Roberts's words almost always strike at the deeper vein of nature itself, choreographing facets of the Canadian wilderness and rural Yukon with a fluid, meditative glory. She personifies the seasons, the world, the winter, giving them life; "February ate / a cord of wood, / a snow shovel, / and a beaver hat." She gives personality to the animals of the cold world, sometimes with a grim respect, other times with a gasping chuckle: "...before the ground freezes, / plant some trees. // The beaver, she'll take three dozen. / She's building / a house too." When Roberts is done turning her lens to the center of the earth's mechanism, she tilts it towards humanity in her second section, examining the cruel twists and turns of storied populace, like a river coursing through their souls. Passages in her section detailing 'what-if' poetic accounts of the people of the Yukon Gold Rush take the form of exchanged addresses, with headers like "in which a woman addresses the river", and "in which the river responds". Other subjects of exchange include citizens of the town (woodcutters, law officials, prostitutes), salmon, wolves, and a fire which claims wood buildings in its wake. While the traipsing between her poetic voice is the same, Roberts manages to grant a unique character to each fictionalized entity. The fire is shamanistic, unashamed. The river is resentful, but gracious: "Today I am owned. / They dig me out, / make my creeks and streams / crude and blatant.// And still, I deliver you / against the current / of my better judgement." Each two-part story has its own emotional trappings, but almost every one feels worthwhile, a pay-off well-earned at the end. While many of the poems in Here Is Where We Disembark are packed full of energy and contemplation, a few manage to feel somewhat hollow. The introspective meditation of the opening section is not as inherently powerful as the narrative stream in the second half of the book, and, while not boring, some of Roberts's poems leave a distinct feeling of "...and?" upon reading. Nevertheless, it's clear that this is a poet bound to nature at the heart, and demonstrating her connection at top form. The praise that has been heaped upon this collection, including its nomination for various awards (the Gerald Lampert Award, the ReLit Award, and the Alberta Readers’ Choice Award), is well deserved, and almost intimidating in a way. For a debut poetry collection, Roberts has shown she seriously know what she's doing, whether the words that spill onto her paper are her own, or helped forward by the chill of the Yukon in her veins. Really beautiful book of poetry about the Yukon. The first part really focuses on the changing seasons and landscape of the Canadian north, and the second part is inspired by the Yukon Gold Rush. I quite enjoyed reading this. Clea captured the magic of The Yukon as well as the character of The Klondike in the latter poems, in such a lyrical way. This book of poetry is a keeper for many future rereads.